Budgies make wonderful pets and are often the first bird a person ever owns. 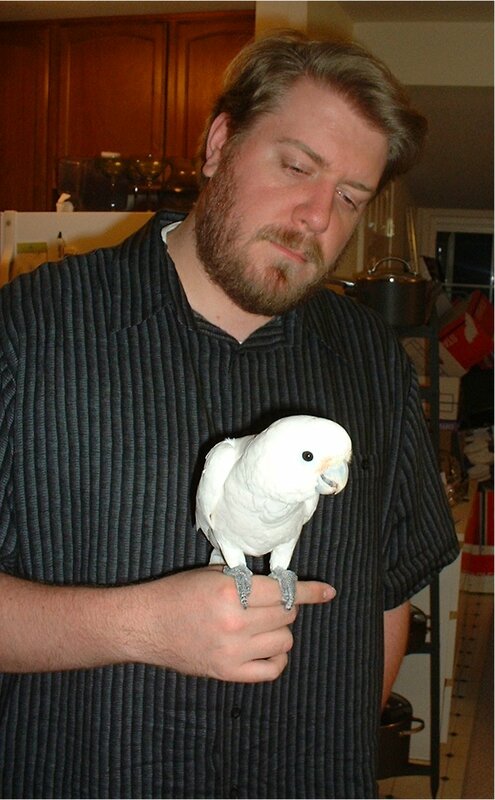 However, budgies usually do not come handfed or tame. They know how to bite, making the most of their small beaks by grabbing onto the skin between your thumb and index finger, or around the fingernail and gnawing. Thus these small birds have the immense power of being able to permanently change a person's perception of birds. Whenever I meet someone who has a negative opinion of birds I can usually trace it back to some untame, nippy budgie they had as a kid. 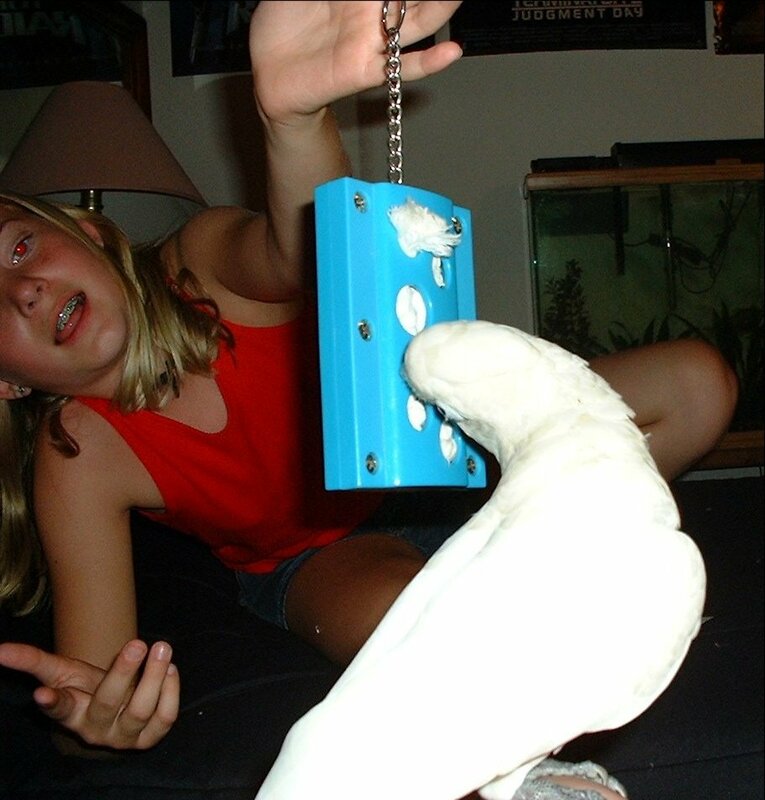 Budgies make wonderful pets, but unfortunately, they don’t usually come handfed or tame. They know how to bite too, making the most of their small beaks by grabbing onto the skin between your thumb and index finger, or around the fingernail and gnawing. Thus these small birds have the immense power of being able to change a child’s perception of birds. 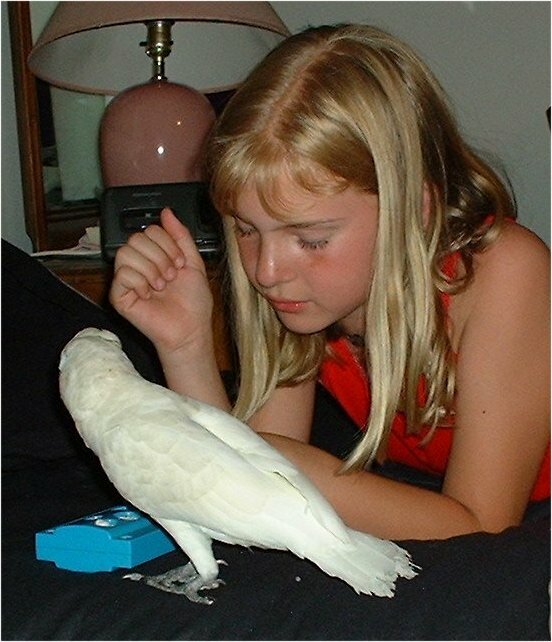 Lucky for me, I was enamored rather than frightened of my first budgie, and managed to tame her despite my ignorance of conventional taming methods. 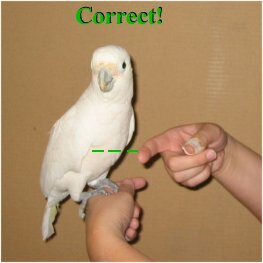 The following method works well for budgies and most other untame birds. Budgies are best purchased one at a time. Single birds are much easier to tame than multiple ones. Once your first budgie is tame you can buy a second one, and the first one may actually help you tame down the second. Birds watch each other closely, and a frightened bird may relax a bit if it sees a tame bird interacting with you. If you make the mistake of buying two budgies at once they should be separated (sight AND sound) for taming sessions. Clip both the wings or have a professional do it for you. They will grow back, but I recommend clipping even once the bird is tame. Once you get the bird home give it about a day to adjust. Taming should be done in a small room without much furniture. Bathrooms, shower stalls, and hallways that can be blocked off work well. The bird should be transferred from the cage to the taming room with as little fuss as possible. The cage should be completely out of the room. If you have other birds the training room should preferably be out of sight and sound of them, regardless of species. You basically want an area with you, the bird, the training tools and nothing else. Tools needed for taming include food treats, a towel, two wooden dowels (perches) and a book (any). Millet spray is a great treat for any bird; grapes, nuts and other fruits can be used for larger species. The first session is designed to demonstrate that you are not some ravenous predator out to kill the bird. It is unnecessary for birds which are less frightened of humans. The procedure is simple: Place a towel on the floor a few feet away from you and place the treats on it. Place the bird on the floor, sit down and read, and completely ignore it. The bird will probably move as far away from you as it can. This is why the room must be small- you want the bird in fairly close proximity, not 10 feet away. Feel free to chirp on occasion, but avoid making eye contact. Eating healthy finger foods like carrots or popcorn while you read also helps. 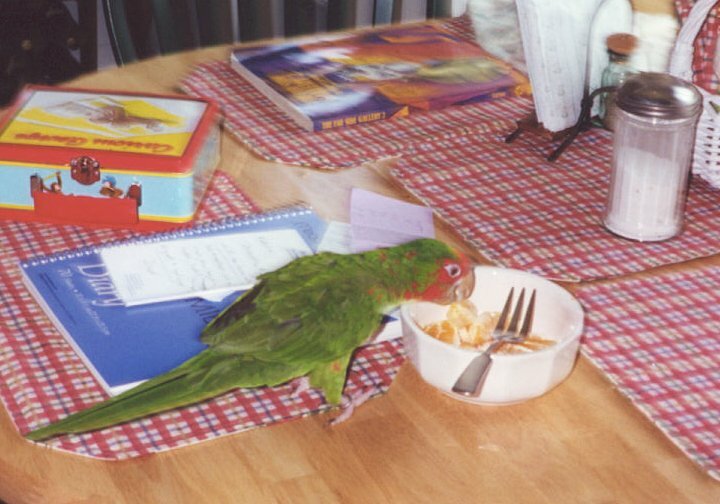 Eventually it may get the courage to taste some of the treats, move about, or preen. At this point you can probably start the next session type. The second session type is stick training. The object is to get the bird to step up onto a wooden perch, and eventually a finger. You'll need two perches that are familiar to the bird. Don't use anything strange or fancy that could frighten the bird. Wooden dowels from the bird's cage work well, because to some degree they resemble fingers in thickness and color. I'm pale so plain dowels work for me. Manzanita might work better if you have darker skin. 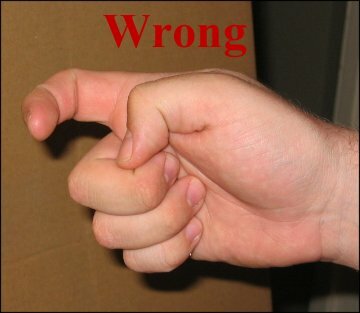 It doesn't have to be exact, you just don't want your fingers sticking out. A T-stand can also be helpful. Start by holding the perch at the very end and getting the bird to step up on the opposite end. This can take a while. 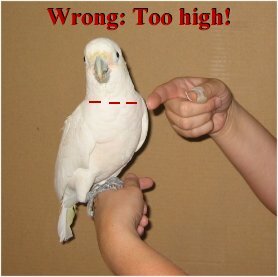 Most birds step up willingly if correctly prompted. The perch should be offered above the feet, slightly lower than mid-chest. Too low or too high and the bird won't step up. Gently push into the bird to move it off balance, and it should step up. Some birds heroically cling to their current perch, regardless of how off balance they are. You just have to be persistent with these guys. Praise the bird once it steps up correctly, then try again. This time use a word to ask it to step up. "Up" is the standard word, but pick whatever you know you'll use on a regular basis. I usually fall back on "come here." Whatever you choose, use it consistently and have anyone else in the household use it as well. Remember to praise the bird profusely after EVERY correct step up. Next you want to make the transition from perch to finger. Continue the step ups, but each time slide your hand along the perch a bit closer to the bird. If the bird freaks out move back and inch or two and try later. 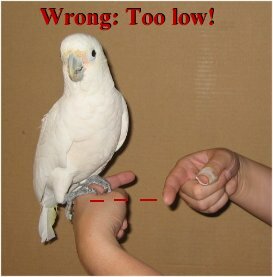 After a while you should be able to get your finger directly under the bird's feet while still grasping the perch. At this point you can try switching completely to fingers. Once the bird is finger trained in the taming room, try it again from the cage. Try to give it something fun to do when it is outside the cage, so it has a reason to come out. A playstand stocked with millet or other healthy treats should work well. If your bird can happily play by itself on a stand with you in the same room then you've accomplished a lot. Petting is something people tend to worry about, and it can't really be trained. Not all birds enjoy being pet, and it's not something you want to push them into. 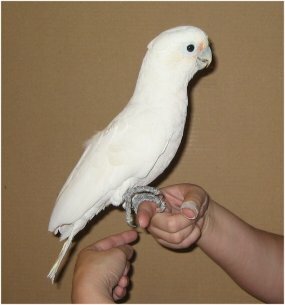 Cockatiels, cockatoos and conures usually like being pet; budgies don't. Focus on building a good relationship with your bird. Earning their trust is key. Handfeds need virtually no time to adjust. Don’t avoid them. Instead, immediately start handling and talking to them. Try to learn as much about your used bird as possible. What did it eat? Was it kept around children or pets? Physically abused? Exposed to toys? Other birds? The answer to each of these questions should influence how you treat your new bird. A bird with limited exposure to children, pets, toys and new foods may show fear at the introduction of any of these. Birds kept isolated from other birds for years probably have no flocking skills, particularly if they’ve been housed with a mirror (mirrors generally make birds antisocial or territorial around humans as well, and should be removed). In this case you must use extreme caution when introducing it to other birds. A physically abused bird may be very fearful of humans. Fearful birds take much longer to tame down. If the bird is cage-bound you may want to keep it in the original cage, no matter how inadequate, to make it feel more secure. You may even want to cover one side. 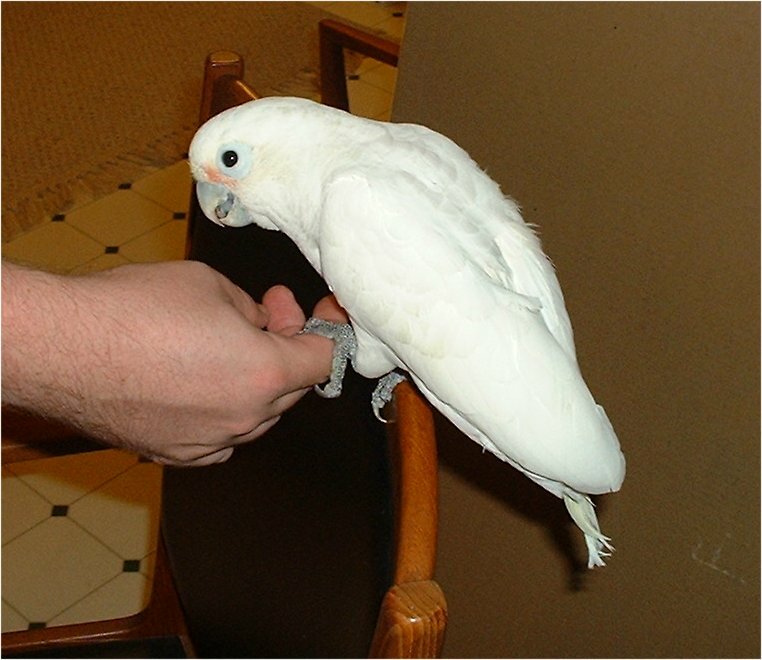 Taming here involves making the bird feel welcome, then gradually introducing hands in a nonthreatening manner. It is essential that you move at a pace the bird is comfortable with. The object is to very slowly build trust, and this can take a very long time. Your attitude should be one of confidence and calm. Birds are very good at reading your emotions. If you are confident, the bird will be more likely to do what you ask. If you are calm and relaxed, the bird should relax too. Many people are initially nervous about being bitten. These people tend to be overly timid, tense, and will jerk their hand back at the slightest provocation. You absolutely cannot act like this. The bird will sense your tension and become nervous as well. Practice with very tame birds first before approaching strange ones. Keep in mind that birds use their beaks like a hand. They will often reach out with it to steady themself when stepping up, particularly if you are holding your hand too high or too far away. The approach is simple. Walk towards the bird with your hands behind your back. Constantly talk to it in a sweet voice. 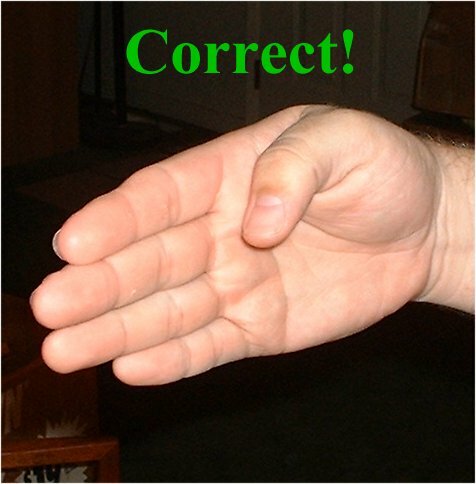 Extend your hand with your fingers straight and your thumb down. Hold your hand up to the bird mid-belly. Do NOT press down on its feet. How is it supposed to raise its feet if you’re pressing down on them? Likewise, don’t hold your hand too high. Sticking your finger in its face is asking for something, but that something isn’t stepping up. Most handfeds are finger tame and should not have a problem stepping up so long as they are approached correctly. If the bird seems really nervous and tries to bolt, you will need to slow down your approach. Try moving your hand in from the side along the perch. Stop if the bird starts to move away, back up your hand and try again. Remember to keep talking to the bird in a sweet voice. Birds seem to compartmentalize human bodies- arms, hands, head, face, torso - all can be viewed as separate objects. What your bird thinks of one body part may not apply to another. Many birds fear hands. Hands can grab, restrain, clip and even hit. If a bird runs away from hands, try offering your arm instead. You’d be amazed how many birds that bolt from hands will readily step onto an arm. The presentation of your various parts also makes a difference. As long as I sit or stand upright, my goffin sees my face as another bird. The moment I lie down my nose magically transforms into a chew toy. Reverse psychology works great on birds. Here, Jennifer was having trouble getting Loki to play with a new toy. 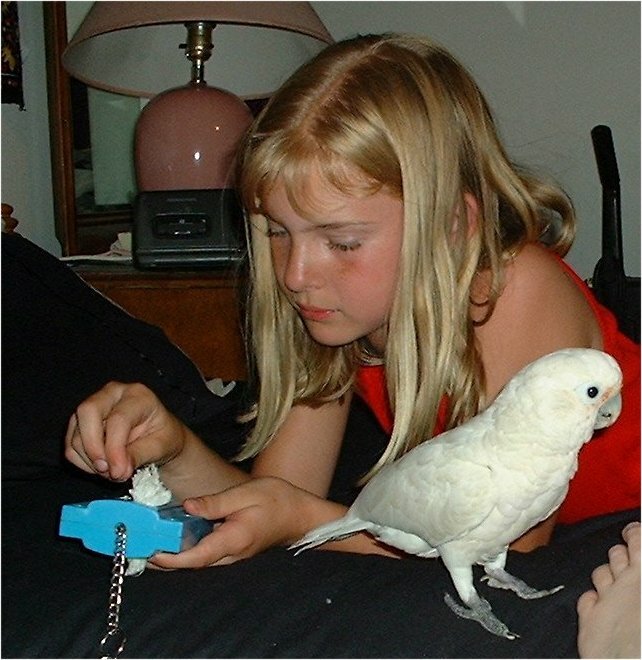 Instead of waving the toy in the bird's face, she completely ignores the bird and concentrates on fiddling with the toy. Loki immediately comes over to see what's up. Articles and images contained on this site are © 2005 by Karen Trinkaus unless otherwise noted and may not be reprinted or used in any way without the author's permission.